Notes from the Field: Amsterdam's Formula for "Sustainable Mobility"
Amsterdam's Formula for "Sustainable Mobility"
In his presentation to local scholars, business leaders and public sector practitioners at PSU's College of Urban and Public Affairs, Dutch transportation planner and German Marshall Fund Fellow Thomas Straatemeier asked his audience whether in his reflections on Portland's accomplishments in the realm of transportation and land use planning, they wanted him to consider Portland as an American city or a European one? Because if it's reflection in comparison alongside other U.S. cities, then Portland is a standout to be sure, but in comparison to some examples from Europe, then it still has a long way to go. There was, however, a lot that European cities could learn from Portland, in his estimation, as well. planning expert Thomas Straatemeier at a recent First Stop Portland debrief session. What can Portland learn from European Cities? When land uses are flexible and adaptive, transit is most effective. Coordinated planning helps ensure the efficient use of land while contributing to local business development and sustainable resource use. For example, in some cases it makes sense spend more on meandering rail alignments that weave into and out of existing commercial centers rather than laying tracks in cheaper corridors further from potential economic development. And for goodness sake, where is the bus rapid transit? Expand your thinking about the potential of the bicycle. 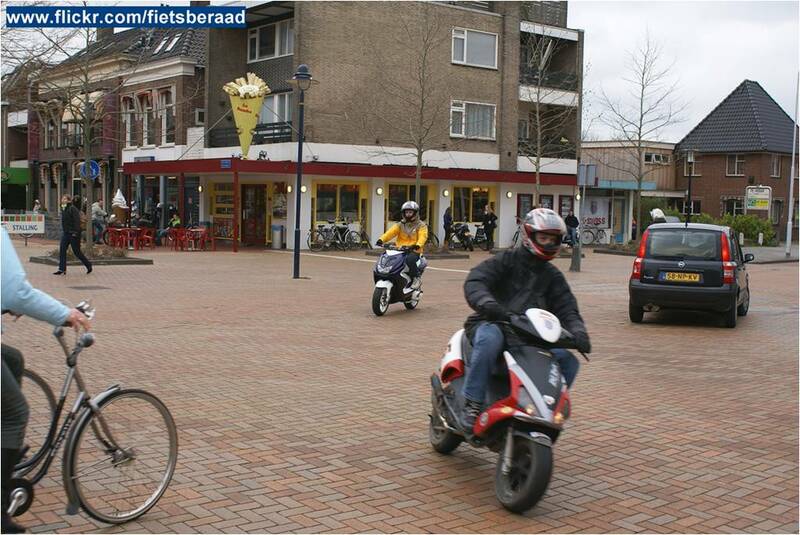 Electric bicycles are the fastest growing segment of the market in the Netherlands. Bikes are efficient, effective, inexpensive transportation options for many people. Amenities like ample bike parking and extensive cycle highways help existing users ride farther and encourage new riders onto the roads. Don't be afraid to engage in demand management. Parking in downtown Amsterdam is scarce and expensive. Speed limits are below 20 mph citywide. Parking is directly tied to employment. In, other words, the automobile is actively discouraged from occupying Amsterdam's streets. The most effective tool in Amsterdam's tool box the past four decades? No big box retail allowed in the urban core; daily shopping is local shopping. Remember to think about access in terms of activities and destinations. Although Portland is on the right track with its "20 Minute Neighborhood" planning concept, in Amsterdam, they are evaluating transportation access in terms of activity patterns by demographic, i.e. which users require access to which services at which times of day. Although they don't go quite as far as Japan's "Yuppies at one transit station, elderly at another" development model, Amsterdam is tracking access to health care, education and employment in addition to retail at the station level. The "last mile" doesn't have to be a problem. Transit trips around the city and region are important, but often times it's those pesky single miles between the home and station or station and final destination that prove the most challenging for transit riders. In Amsterdam, dual bike ownership is on the rise--one bike at one end, one at the other, both parked safely away from the elements. Bike sharing, from Straatemeier's perspective, needs to be a regional strategy as opposed to a city center model. And connectivity is the key--development needs to be contiguous to be functional. What does Portland have to share with European cities? Celebrate transportation options. From the Streetcar Mobile Music Fest to Pedalpalooza, Portland celebrates it transportation options and the cultures that emerge alongside them. Shared goals are important. Collegiality is business as usual in Portland and goals shared across stakeholders and sectors help the region realize its cohesive land use and transportation vision. Coordinated, regional land use planning is essential. That cohesive land use and transportation vision is developed and deployed at a very effective scale--temporally and geographically. Thinking about land use and transportation planning from the regional level over a long time frame is great. Establishing a single transit authority to administer it? Even better. Learn how and why to do civic engagement better. In addition to fragmented regional interests in Amsterdam, the top-down model of planning does little to engage citizens in shaping places that work for them. Portland has a lengthy and robust legacy of public participation in a planning--something its European counterparts could learn from, to be sure. Get creative with development incentives. Innovative approaches to joint development, tax increment financing, local improvement districts, and public-private partnerships have helped the region realize its transit-oriented development goals. Put equity on the agenda. Increasingly, Portland's regional land use and transportation plans rank equity and accessibility as primary goals. Although this does not always translate at the street level, that the region is even thinking in these terms is a step in the right direction. Summary: Straatemeier's Formula for "Sustainable Mobility"
It's important to know--as a neighborhood, city or region--who you are and where you want to go. Creative approaches to infrastructure development, marketing, demand management, and comprehensive land use planning will help places plan for and bring about the kinds of integrated transportation systems best suited to their local contexts. 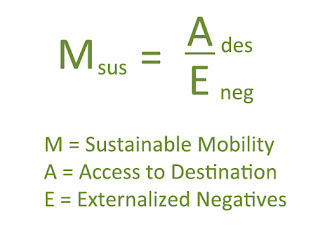 Straatemeier sums up his ideal approach to sustainable mobility as policies and activities which actively minimize the negative externalities of transportation options while increasing user access to destinations. Is this Portland's approach in a nutshell? If not, how do we get there? And if so, where do we go from here? Amsterdam has a great sustainable formula, it's a must for such a small but populated city.